When Cody and I planned our European road trip there was one place on my list that I knew we HAD to see. Cappadocia was pretty far out of the way for us but I am so thrilled that we made the journey there. I absolutely fell in love with this magical place in the mountains of central Turkey and I absolutely urge you to add it to your bucket list and visit one day soon. Cappadocia is hands down the best place I’ve ever visited and I will be going back again soon. First things first, let’s address the elephant in the room here. Cappadocia (or Kapadokya to the locals) is in the centre of Turkey and lots of people have asked me if I felt safe there as there have been terrorist incidents in Turkey in the not too distant past. Guys, I felt absolutely and completely safe. The only place in Turkey that concerned me was Istanbul, and that was because we drove through there on the first evening of the 9 day long holiday and the roads were MENTAL. At no point did I feel threatened or uncomfortable, I just thought that there was a possibility of a small bump on the roads. Please bear in mind that this was not the case in Cappadocia (I recommend renting a car while you’re there to get around as the area is quite big – more on that later) and the roads were completely fine; I only felt like that around Istanbul. If you’re worried about being caught up in something bad in Turkey I completely understand however I’m not the kind of person to cut out parts of my life through fear that something may happen to me – after all, that’s what the people carrying out these incidents want right? Cappadocia, a UNESCO World Heritage Site, is known for it’s unique geological formations that date back thousands of years. The rock formations known as “Fairy Chimneys” are actually peaks of volcanic rock into which homes and churches have been carved. Many of the hotels are actually cave hotels which have been cut into these rock formations. 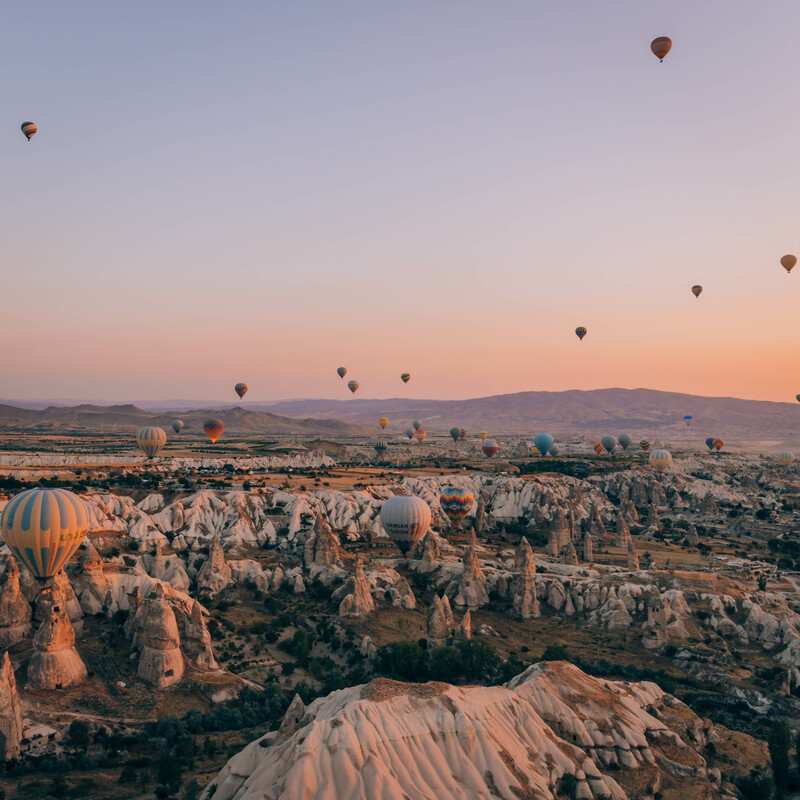 Cappadocia is located in the mountains (it’s about 1,000 metres above sea level) so despite the temperatures in the high 30’s during the day in summer, it still cools off at night. Take a jacket out with you when you head for dinner and make sure you’re warm enough at sunrise, especially if you’re waiting for a balloon ride as you’ll be outside for a number of hours. All three hotels are typical cave hotels and are very beautifully designed and exceptionally comfortable (especially as we’re currently living in a van so this was a major treat). I knew that I wanted to take sunrise photos at Sultan Cave Suites and Museum Hotel but I also knew that there was a chance the balloons might not fly all of the mornings we were there if the weather wasn’t right so we chose to stay for 4 nights. The balloons weren’t able to fly on our first morning due to the wind so we were pretty lucky with the hotels we booked as I was able to get my shots at both Sultan Cave Suites and Museum Hotel. In order to take sunrise photos at these places you need to be a guest at the hotel, please don’t just turn up offering money as it’s kind of rude and you won’t be given access. If you were to contact the hotels in advance and ask if it’s possible to visit for the morning perhaps the answer would be different but I wouldn’t know for certain as we stayed at both hotels. Both of these hotels also have restaurants and we chose to eat at both the restaurants while we were staying there. The food was amazing and seriously good value and we were able to try traditional dishes and drinks from the local area with both restaurants opening for lunch and dinner. Sultan Cave Suites, which is located on the hill above Goreme (it takes 5 minutes to walk into the centre down the steps at the hotel), was my favourite hotel as the location was perfect and the price for a room was very reasonable. We paid £150 for two nights including breakfast. The roof terrace is perfect for photos both at sunrise and throughout the day through to sunset and the staff were so welcoming and helpful. There is also a bar at the roof terrace serving everything from traditional Turkish tea and coffee to beers and wines. The hotel is also home to a dog called Izmir and she is adorable, she will even pose for photos with you if you ask the owner. I love dogs so this was a big plus for me! And oh my gosh the shower. You need to experience those showers at least once in your life, seriously! Museum Hotel is more expensive as it’s a well-renowned, luxury boutique hotel (we were given a tour on arrival as the hotel is also designed like a museum with important and old artefacts on display and we discovered there are three peacocks living in the gardens – one of them is entirely white – and there is also a tortoise garden home to several different sized tortoises). Despite the price its definitely worth a stay as a treat for one night at least, if not just to experience the huge breakfast spread. However, it is more out of the way and having a car or a scooter would be very useful if you’re staying here. Local Cave House is right in the centre of Goreme and is literally built into the side of the rock with a perfect pool located right in front of the famous fairy chimney that stands as the centre piece for the hotel courtyard. Again, the hotel is very reasonably priced but because it doesn’t have a roof terrace to watch the balloons at sunrise, we chose to take our balloon flight the morning after our night at this hotel so we didn’t miss out on sunrise views from the other two hotels. We booked our balloon tour through Museum Hotel while we were staying there and we requested a company that takes maximum 20 people up in the basket so we would definitely have a good view and room to breathe. We were picked up from our hotel at 4:30am (this time will change depending on the time of year and sunrise time etc) and driven to the Kapadokya Balloons main office in the centre of Goreme where we checked in and were treated to breakfast (pastries, cereals, hot and cold drinks). We were then told to board the busses according to which pilot would be flying the balloon we were assigned to. We only had 14 people plus the pilot in our basket so we had plenty of space. There are literally hundreds of balloons in the sky at one time and each company has multiple balloons over two flights each morning. If you can, request to be in the first flight of the morning as you’ll be up in the air as the sun rises from behind the mountains and it is absolutely breathtaking. Our pilot was Unal, a young and cheerful guy who’s been flying for 7 years. If you can, I would request to go up in his balloon as he made the experience that extra bit special for us. We took off and flew over Goreme, the Rose Valley, the Pigeon Valley, all pointed out by Unal who was a great guide as well as our pilot, and reached a hight of 1,200 metres above the ground to which Unal announced that we were the highest ballon in Cappadocia (and we most certainly were)! It was at this height that the sunrise peeped its golden head over the mountains to the east and I’d be lying if I said it didn’t make me feel emotional because of the sheer beauty of the landscape and the hundreds of other balloons at various heights below us. It left me speechless. If you’ve been following me on Instagram or read my previous blog posts you’ll know that I’m really scared of heights so I was super nervous about taking a balloon ride however after the first few minutes I completely relaxed and thoroughly enjoyed myself. The balloon flight is so smooth and still and when you’re high in the air it is incredibly peaceful and quiet. Lots of people come to Cappadocia but skip the balloon ride and I seriously think they’re missing out. Yes, it’s expensive (150 Euros each) but it is sooo worth it!! We even met a guy who loved it so much he did it again a few days later! When you land (landing can be pretty bumpy, be prepared for screaming haha) the crew on the ground from Kapadokya Balloons who follow you in the van throughout the flight, quickly set up a table with champagne and cakes to celebrate your flight. We were given certificates to congratulate us for flying and we were driven directly back to our hotel. Overall the experience was second to none and I would highly highly recommend taking a balloon flight with this company if you visit (this is not sponsored guys, I just had an absolute blast)! Obviously the number one attractions here are the sunrise balloon flights. Balloons fly every morning at sunrise as long as the weather permits. There are no flights during the day or in the evenings so you will need to force yourself out of bed around 5am or earlier to catch them. Many hotels have wonderful views from their terraces and you can also head out into the valleys and viewpoints to watch the balloons fly past. There are several viewpoints that I would recommend. Firstly, the Goreme viewpoint which is easily accessible if you’re staying in Goreme. We didn’t head up here however we met a couple called Brooke and Dylan who did watch the balloons from here and they took an amazing time-lapse video which they showed to us and it looked beautiful. I would also recommend visiting Rose Valley and Love Valley for sunset as well as to watch the balloons fly past. Again, we didn’t get a chance to watch the balloons here but we did go up for sunset and it is beautiful. If you head to any of the viewpoints for either sunrise or sunset make sure you get there early and don’t turn up just as the sun is hitting that golden half an hour as it gets very busy and you won’t find a good spot if you don’t get there before the crowds. Goreme is home to the biggest Turkish rug collection in the world. Galarie Ikman carpet store is a 20 room home to 300,000 rugs, all handmade, and is a family run store, supplying rugs all over the world. If you want to take a photo in here you have to pay a small fee. We were charged 20 Lira although I’ve heard other people being charged different prices. We spoke to the owner for a while to learn more about his collection which I recommend doing, not just to be polite, but because it was extremely interesting to learn about his collection. Moving further out of Goreme you find the Goreme Open Air Museum which is an area of beautiful fairy chimneys carved into churches and homes which have cave paintings and original skeletons on show. This is definitely worth a visit, even though there is a small fee, to experience what it was like living in the area for people hundreds of years ago. Further along the road you come to an area called Pasabagi, Zelve which is free to enter and is home to more fairy chimneys. The most popular spot is the church to the right of the area (pictured) and is where the famous Instagram photos are taken. We also decided to take a hike through the Rose Valley during the day time, after visiting at night for the sunset and it was amazing to walk through the pink coloured rock and cave homes. We had the whole place to ourselves which was a bonus. I actually can’t put into words what I felt when I first saw the balloons rising from the terrace at Sultan Cave Suites. It didn’t feel real, it still doesn’t feel real because I’d seen all the photos online yet here I was watching it with my own eyes. It left me speechless and I still have a warm fuzzy feeling inside my stomach every time I think back to that first moment and my whole time there in general. The Turkish people are so welcoming and helpful (they even feed and water stray cats and dogs and take them to the vet if they get injured) and they helped to make my trip even more that perfect. My heart now beats for Cappadocia and it is hands down absolutely my favourite place in the world now. I can’t wait to go back and fall even further in love with this beautiful place. Absolutely none of the things mentioned in this blog post were sponsored – these words are my genuine opinions of our experience in Cappadocia. Big thanks to Nihat for helping me to plan this trip. You can find him on Instagram here. Thank you for this amazing article!! I would love to visit this place!! What camera do you use? The shots are wonderful . Thank you! These were taken with a Canon 6D mk ii and 24-70 f4 Canon lens and edited with my presets that you will be able to buy in the shop tab of my website from tonight!